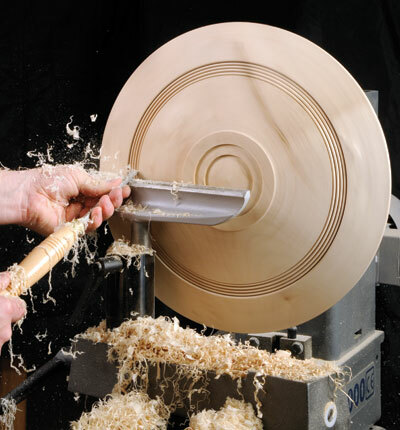 Tool manufacturer, Ashley Iles, have long been held in high-esteem amongst the turning and carving fraternity. By introducing these new bead-forming tools they have demonstrated an understanding of customer's needs and the tool solves a common problem faced by even the most proficient turner: how to easily cut consistent beads that can be aligned precisely and cut cleanly. These beading tools are available in 3, 6 and 9mm sizes, but don't be fooled; they are not scraping tools. The tool comprises a flute which is machined along most of the length of the blade and is actually on the underside of the tool. This section can then be placed on the rest. The tool should be presented handle-down as the front end has a bevel which, when the handle is held low, presents the flute at a nice cutting angle to the work. The wings are then able to score the timber prior to the bead form cutting the profile required. Once one bead is cut, placing the wing of the tool in the groove of the bead will give you a series of nicely aligned concentric beads. woods work well and are all good to practise on. Another important point to make here is to ensure you do not cut the bead to the full depth of the flute. Leave a micro flat on the bead, maybe 1/32in or so, to prevent the crown of the bead from shattering. The micro flat can then be easily sanded away. Also, refrain from using the bead forming tool to reduce the depth of the wood. 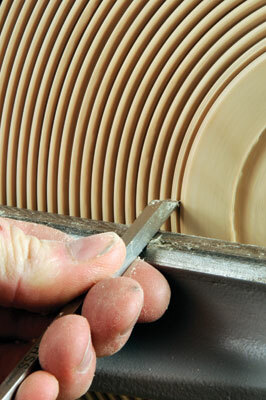 Instead, cut to the surface depth required with another tool and use the bead forming tool for cutting the bead only. If you do use it to reduce the depth, you risk fracturing the crowns of the beads. To get the most from the tool, ensure it is kept honed across the end level but be careful not to hone the flute. I found the tools to be very simple to use, it kept sharp throughout and were a joy to use. They certainly work very effectively and allow making bead forms of a uniform size, a very simple exercise. "I found the tools to be very simple to use"